Life in the Country. Botany and Books. Chloe Marr by A.A. Milne ~ 1946. This edition: E.P. Dutton & Co., 1946. Hardcover. 314 pages. More than slightly well know children’s books aside, Alan Alexander Milne’s body of work – plays, poetry, satire, farces, mysteries, literary novels – extended far beyond the nursery, as this rather obscure novel – his last – goes to show. A frothy sort of romp is what the flyleaf promises, but though there was a frequently comic lightness to this depiction of a mysterious socialite, something more poignant soon became apparent, growing and building as the tale’s many strands weave together towards the end, turning comedy into something ultimately sobering. As the clock struck twelve on this late June morning, Miss Chloe Marr, fragrant and newly powdered, came like a goddess from the bath, girdled herself with Ellen’s help, and stepped into her knickers unaided. A telephone bell rang. And we’re off, witness to Miss Marr’s endless joustings with men on the other end of a telephone line, and across a restaurant table (the best one in the house, of course), and in her very bedroom, bed made up neatly but not too neatly, because we wouldn’t want to think that delectable Chloe hadn’t spent the night there, all alone in her own boudoir. And do you know what? According to all eyewitness accounts, she does sleep alone. Erotically tantalizing – deliberately so? – yet chaste as a dewy gardenia, Chloe is pursued by an eclectic array of men, from neophyte artist to duke of the realm, who worship at her shrine and put up with her constant elusiveness and the constant company of their fellows-in-desire, on the off-chance that one day she will focus on just one. This is a novel of vignettes and episodes, and the viewpoint constantly changes, but Chloe is always somewhere in the frame. Milne’s long facility with words comes into full play here; the novel is a complex construction but not overly so that we never lose sight of its progression and its goal, ostensibly a fuller portrait of a woman who is more – and possibly less? – than she seems at first glance. 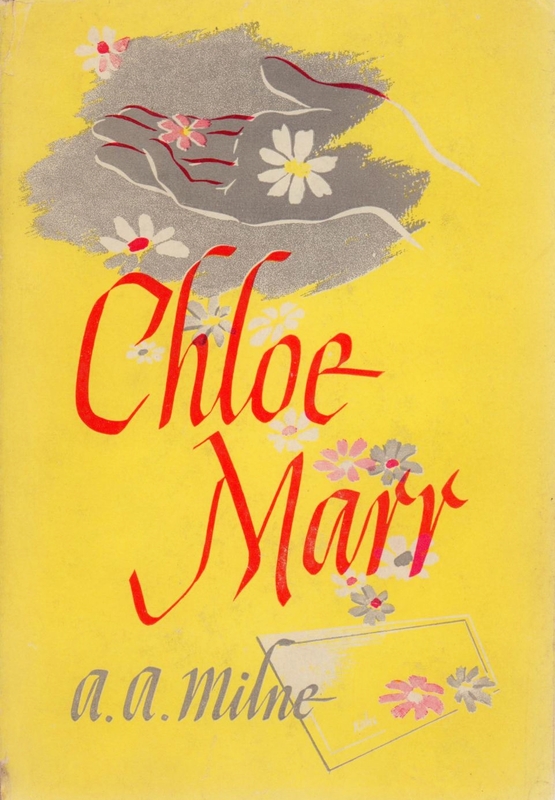 Contemporary critics were of mixed minds as to Chloe Marr‘s literary qualities – many sneered – but the public went ahead and bought the book regardless – the A.A. Milne name being an automatic guarantor of sales – and it went through sufficient editions to make it reasonably obtainable today. I wouldn’t go so far as to call Chloe Marr a “hidden gem” – its qualities are not so great as that – but I did find it enjoyable to read, nicely thought-provoking here and there, and exceedingly interesting in its structure as a character portrait involving onlookers providing all of the impressions and insights regarding a certain person’s true nature. I’ll be watching for more Milne novels in my vintage-bookstore travels. Chloe Marr is one of only a slight half-dozen or so. Two People (1931) is perhaps the best known; it was republished by (the now possibly defunct?) Capuchin Classics in 2009. I am merely a reader, a consumer of books for amusement and personal instruction, not a professional reviewer - and that is indeed a worthy profession, an important literary craft - so these posts are merely meant to be one person's reading responses, not scholarly reviews. Early on in this blog I began rating the books I talked about on a 1 to 10 scale; it was meant to be a quick way to communicate my personal degree of satisfaction/pleasure (or the opposite) in each reading experience. To emphasize: These are very personal, completely arbitrary ratings. These are merely meant to be a measure of the book's success in meeting my hopes and expectations as a reader. 5 & higher are what I consider as "keepers", in various degrees. A 10 indicates that I can think of no possible improvement. Ratings under 5 are rare & I struggle with giving those, but in all honesty sometimes feel them appropriate for, again, undeniably arbitrary and very personal reasons. Each book is rated in its own context, NOT in comparison to the entire range of literature, which would, of course, be an impossible task. Still here! Still here! With a very brief glimpse at a Greek island memoir by Carola Matthews.